What is it about roadworks? Another ranting blog! The other day while driving, I have been getting increasingly frustrated about roadworks! In particular, water and gas main works that take weeks (sometimes months) to complete! Okay, fair enough, these works are needed to replace pipes to prevent water bursts and gas leaks, but why does it take so long to do then? When the workers start digging…that’s easy, the road is dug open really quickly so they can replace the necessary. But it takes ages for them to cover the holes! And when you drive on the road sometimes, the workers don’t appear to be there at all! What are they doing? Do they do short shifts? Talk about getting the job done on time. 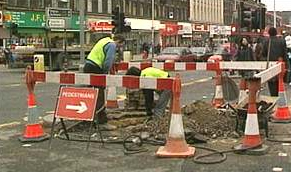 In some cases, there are times when a road has to be entirely closed because the roadworks have to be done and another big hole has to be opened. I remember one event many months ago when a water company dug a hole up to repair a water pipe. The drain had been raised and left for about two weeks! Some people complained so much that workers were forced to return and lower the drain. The paving slabs were not replaced…instead, they just added tar with an excuse: “The work is not finished yet and we need to do more work on the drain”. They haven’t returned since. Enough of my rant! What are your experiences with the holes in the road? Good or bad? I personally think it is a huge disruption…especially if it takes weeks to complete! Let me know!